October is fair-time in Stratford-upon-Avon and the surrounding towns as the travelling rides, the prize stalls and the hot dog stands fill the town’s streets. 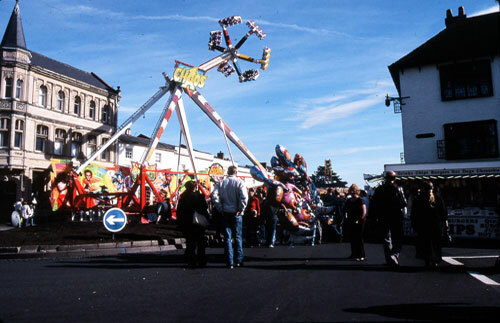 The traditional pig roast is still part of the Mop fair as is the fortune-teller’s tent which stands near the old market cross site. The itinerant fair with its fortune-telling was a reminder that in Shakespeare’s time people who travelled for a living were suspicious. A surprising number of people in the plays move, from necessity like As You Like It‘s Rosalind and Celia disguising themselves to find a new home after banishment to Edgar’s disguise as a beggar after being accused of plotting to murder his father in King Lear. These people leave their homes because they must, but it’s the pedlar Autolycus in The Winter’s Tale that is Shakespeare’s best example of a person for whom travelling is a job. As a pedlar, a kind of travelling salesman, Autolycus is welcomed because he brings luxury goods and entertainment to a rural community, though the audience knows him to be a thief and a cheat. Of the new’st and fin’st , fin’st wear-a? For my lads to give their dears. He also carries the latest ballads, and another valuable commodity, news: “I love a ballad in print… for then we are sure they are true”. Itinerant people, among them acting companies, were still treated with suspicion. During the 1590s legislation was brought in to control these rogues and vagabonds. Itinerants were not only possibly thieves, or people who might be a drain on the resources of the places to which they travelled, they could be political or religious activists. The British Museum’s current exhibition Shakespeare: staging the world, contains a fascinating and extremely rare object. It’s a trunk which on the outside looks just the sort of thing Autolycus, the pedlar, would have carried, but in this case it contains not ribbons and songs, but Catholic vestments, rosary beads, a chalice, and even an altar stone. 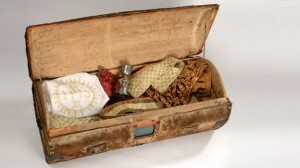 A Catholic priest, carrying this trunk, had everything he needed to carry out religious services. The trunk had been walled up in a country house in Lancashire, where it was discovered in the mid-nineteenth century after at least two hundred years. Lancashirewas a hotbed for recusancy, and following the banning of Catholic priests in the late 1500s they had to disguise themselves in order to carry on. 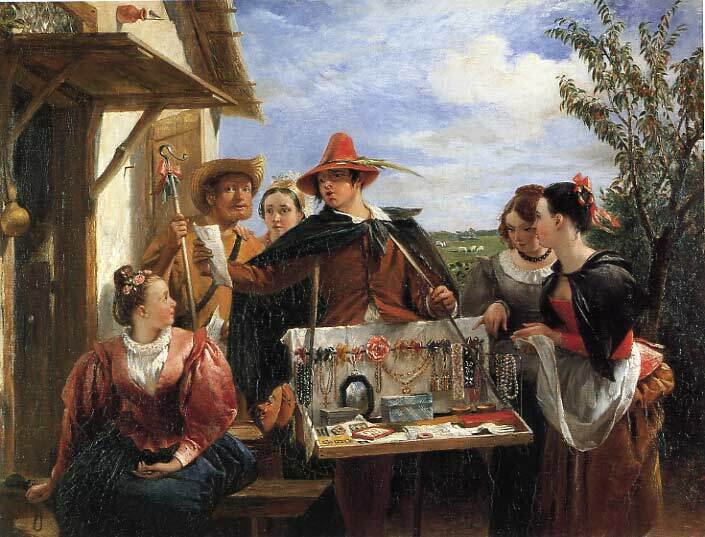 A travelling pedlar would have been a good disguise, as many of the objects he was carrying could be easily taken for legitimate goods for sale. Itinerant fairs like Stratford’s Mop can seem an anachronism, taking over town centres and disrupting normal life. But a couple of days when the streets fill with noise, lights and music always seem to me a small price to pay to be reminded that our normal orderly world may be turned upside down. Fairs, and the outdoor streets where they take place, can still be places where the normal rules don’t always apply. This entry was posted in Plays and Poems, Shakespeare's World, Stratford-upon-Avon and tagged Autolycus, British Museum, Mop Fair, Shakespeare: staging the world, The Winter's Tale. Bookmark the permalink.